It seems like Hasbro really has their stuff together. Waves are coming out as fast as we can find them. Finding them is the hard part sometimes. This wave I found across my 11-state road trip. This is our first figure, and rightfully so, it is how Tony Stark found Peter in the first place. A kid running around in a hoodie and mask. This wave is the “Vulture Wave” as you buy the parts to build Vulture’s wings from the Homecoming movie. That is a first for the Marvel Legends line. We have had many many many Build-a-Figures, but this is the first Build-an-accessory. That being said, we are talking about a set of wings that are an awe-inspiring 23 inches wide. When we are talking about 1 inch equaling 1 foot, that is a HUGE wingspan. I take pictures of my Marvel Legends on a 2 foot square diorama. I cannot even get all of the wings in the picture. That is a crazy big set of wings. But we will be getting to him. You will notice as we go along with the figures, that the wing pieces will begin to show up in the background. Each character comes with a piece. Seven figures, seven pieces. Let’s take a look at Spider-Man, or as Tony Stark would call it, Spider-Man Mark I. When we first caught up with Spider-Man in Civil War, he was running around in this outfit. He stated that the goggles helped him to focus his senses since they were heightened and going crazy in a fight. He comes with a set of fists and his hood is down. Spider-Man comes with a second set of hands that are web-slinging hands. They are in more of a natural pose for how a person actually does the web hands as opposed to the comics where Peter has exaggerated finger posing. He also comes with a second hood, so he can have his hood up. Is this inspired by Spider-Gwen? Maybe. I noticed a few times in the film that he had his hood up, but generally in a fight situation the hood was down. Better to see, and no real way of keeping it on. I am glad we got two variations. This is a great first figure for the wave. Since this is the Vulture Wave, you know Vulture is coming. We will also be looking at a new suit Spider-Man. And that is all. We do not get anyone else from the movie. Boo! This would have been a great time to get a few more movie figures in regular clothes. Shocker anyone? The rest of the wave is made up of comic characters. And believe it or not, since it is a Spider-Man wave, we will be getting 3 Spider-Men this time around. About typical with each Spider Wave. 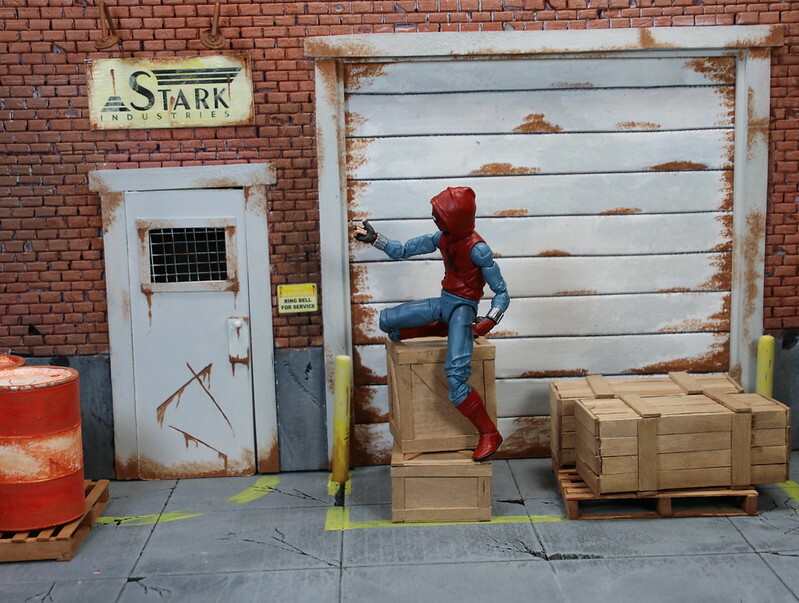 This entry was posted on Tuesday, July 11th, 2017 at 5:16 pm	and tagged with Hasbro, Homecoming, Legends, live action, Marvel, Marvel Legends, movie, movie figure, Peter Parker, Spider-Man, Spider-Man Homecoming, Tom Holland, Toy photography, toy review and posted in Action Figures, Comic Books, Comics, Marvel, Movie, Movies, Toys. You can follow any responses to this entry through the RSS 2.0 feed.